The polling place was full this morning. I had to drive all the way around the block to find parking (notice the line of cars), which I can’t recall ever having to do at this location. (The 2016 election used a different polling place for this area.) I wondered if I should have walked there and back instead of stopping by on my way to work. But they had just enough voting booths to handle everyone. There was literally one person ahead of me in line to sign in. While we waited for other voters to finish with their booths, someone came in to drop off his family’s mail-in ballots and then cast his own in person. Then a booth opened up, I marked my ballot (on paper, fill-in-the-bubble style), and went over to feed it into the box. I was in and out in about 10 minutes. This entry was posted in Politics and tagged election, voting on November 6, 2018 by Kelson. So you don’t like the candidates in national elections? Vote in the primaries. You don’t like the primary choices either? Vote in the state-level and midterm elections. You don’t like the midterm choices? Vote in your local elections. National candidates don’t appear out of thin air. They start locally and climb up. And those local offices affect you more directly than the national level offices. Plus: the smaller the area covered, the bigger percentage of the final tally is represented by your vote. 1/1,000 may be small, but it’s a lot bigger than 1/100,000,000! This entry was posted in Politics and tagged election, Local Elections on November 3, 2018 by Kelson. Californians! Today is the last day to register to vote in time for the midterm election. We’re choosing the next governor. We’re choosing the House reps & state legislature. For Secretary of State we’re literally choosing between one candidate who’s touting his success registering eligible voters (Padilla) and another whose campaign statement is all about how he wants to purge the voting rolls (Meuser). So get online NOW. If you’re not registered to vote, register before tonight’s deadline. If you are… Check to make sure you’re still registered and haven’t been dropped by mistake (it happens!) while there’s time to re-register. 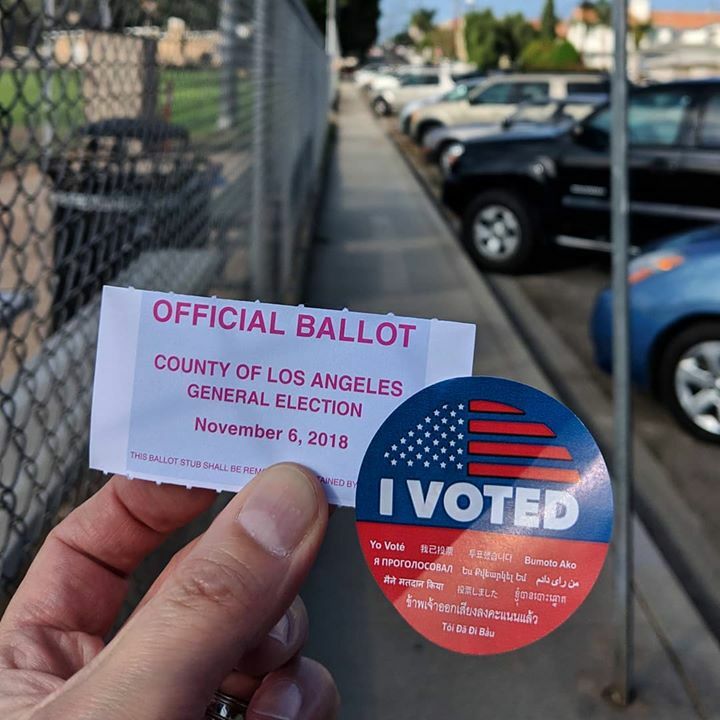 This entry was posted in Politics and tagged California, election, voting on October 22, 2018 by Kelson. Californians: If you can vote this November, don’t sit this one out. We have a governor to choose. We have representatives to select. And we need to shut down the 3-Californias plan hard. It’s a terrible, outlandish, unpopular idea…but in a midterm election (low turnout already) with the specter of voter suppression? Don’t rely on it being too outlandish to pass. No one expected Brexit to happen. No one expected Trump to even be nominated, never mind win the election. Outlandish doesn’t mean impossible. So check your voter registration status. Make sure it hasn’t been cancelled or otherwise lost, because that does happen. This entry was posted in Politics and tagged California, election, voting on June 27, 2018 by Kelson. Putting a straight-party checkbox on a ballot violates a key design principle: The polling place and ballot should strive to avoid steering people toward specific choices. This is also why some places randomize candidates’ names or stick with alphabetical order. The human brain would rather work on auto-pilot than think carefully. Give it an excuse to stick with auto-pilot, and it’ll happily do so. Even if that means outsourcing your vote to the people who chose the slate and designed the ballot. You can choose to vote a straight-party ticket, but the ballot design shouldn’t influence you to do it. This entry was posted in Highlights, Politics and tagged design, election, voting on December 12, 2017 by Kelson.